I truly believe there IS a back story. They didn't have to do this. Unless in the future one sees cooperation or contact between the Vactican and ETs. Seems like they are preparing the way IMO. Personally...I can't see "ET" wanting anything to do with the Vatican. I know there are Catholics here so I'll respect that and just say...that I don't think they actually want contact with any agency. Politicians..religious leaders..paint stories the way they want the public to see them...not as they are. Under the facade of their offices..they are just people...and not a whit smarter than anyone here. Your first statement- most likely true. Your second statement-most likely true, but some children "they" abducted are probably now a part of some "agency. Your third statement-most likely true. Being as those things you mentioned (politicians, etc.) are an "agency" type, they may be "out of the loop" but sure don't want to seem to be. Your fourth statement- partly false. The Vatican people are not a whit smarter than anyone here. But they aren't "just people". They still weld a certain amount of power, seeing as they have the only "pharoh" (mixture of god and man) left on this Earth. (not being mean. I have quite a few Catholics in my family and do attend mass on occasion). Tom Horn and Cris Putnam join Gary as they discuss the Vatican's research into aliens and other space phenomenon. Following the release of their 2012 best-seller Petrus Romanus: The Final Pope Is Here, Tom Horn and Cris Putnam were inundated with invitations from around the world to be interviewed on radio, television, and in print media. These included segments in The History Channel's "Countdown to Apocalypse," a special feature on Canada's largest Christian channel VisionTV titled "I Prophesy: The Apocalypse Series," invitations to Rome to discuss with Italian media their findings on René Thibaut (a Belgian Jesuit whose meticulous analysis of the Prophecy of the Popes predicted the arrival of Petrus Romanus in this era), and dozens more. But that was just the first part of the story. In Exo-Vaticana, the investigation goes into high gear with findings far more disturbing than the authors expected to find. • Revealed! Project LUCIFER and the hidden quest for "Fallen Star"
• The incredible family secret Tom Horn has kept concealed all his adult life! In Exo-Vaticana: Petrus Romanus, PROJECT LUCIFER, and the Vatican's astonishing exo-theological plan for the arrival of an alien savior, internationally acclaimed investigative authors Thomas Horn and Cris Putnam break the greatest story of our time and expose the elitists and intellectuals who are planning mankind's assimilation under a coming 'savior,' one whom the prophet Daniel foresaw as "an alien god." If ET is smart (and if they're here, they're smart) they'll adopt a famous rule of etiquette and avoid all topics of politics and religion We might then be able to be friends. Not only should they avoid the topics of religion and politics but they should also avoid the preachers and politicians. They will be much happier if the do. That means no landing on the White House lawn or on the Vatican's front porch. Ha! I'm just waiting for Bill Nye the Science Guy to get up and say, "Hey, I knew it all along!" When he does that, we'll KNOW disclosure has arrived! I'm guessing..if 'they' have been monitoring us for as long as people have been seeing them, they already have a pretty good idea of our government, judicial system and religions...and we have no secrets. 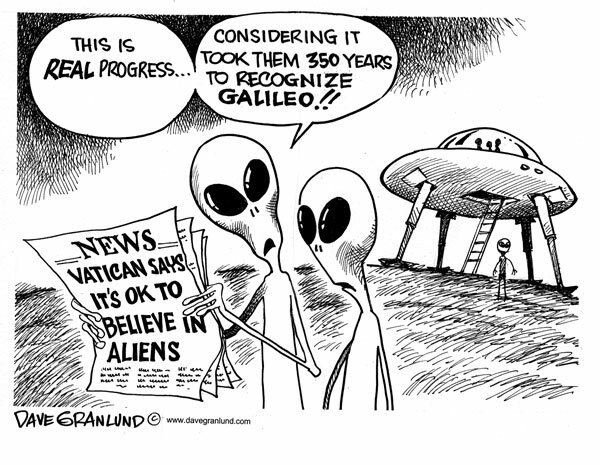 For decades the Vatican has convened some of the brightest minds in the scientific community around the world to ponder the possibility of extraterrestrial life, and to prepare a public disclosure on behalf of the Catholic Church in case the existence of aliens is confirmed. Many scientists affirm we’re not far from establishing the “First Contact,” given the advances made is astronomy. Because of this, the Vatican wishes to be ready with a statement. It might not be a easy task for the church to interpret holy scripture—if not analyzed properly—if life is found on other planets and man is not the only creature made in the image of God. Experts on the study of exoplanets, biologists, companies specializing in biosciences and atmospheric science also participated. About 200 scientists from around the world attended the event “Search for life beyond the solar system.” They’re challenged with facing the possibility of finding alien life using an interdisciplinary approach. The AAS announced the award for Brother Consolmagno in honor of his “distinguished communications on behalf of a scientist to the general public”.This July another advancement made by Jesuit priest Guy Consolmagno, a doctor in astronomy for the Vatican Observatory, was given the Carl Sagan science medal from the American Astronomical Society (AAS). Counting with scientists such as Brother Consolmagno, the Vatican’s scientific endeavors have gained prestige. Brother Consolmagno has appeared in major news outlets, including the BBC, where he has served as an expert on topics of science and religion relating to science. The Vatican Observatory is one of the oldest astronomical institutions in the world, located in Castel Gandolfo, the Pope’s summer home outside Rome. Its research team also operates the Vatican Advanced Telescope in the Mt. Graham International Observatory in Arizona. The Pope’s astronomer has spoken out on his belief that there is definitely life beyond Earth – and says he would happily baptise monstrosities from beyond the stars. In his new booklet, ‘Would You Baptise an Extraterrestrial?’, Jesuit Brother Guy Consolmagno, the new president of the Vatican Observatory Foundation (and keeper of the Pope’s meteorite collection) also asks several other Big Questions (below). Does Jesus’ Christ’s redemption ‘count’ for beings from Proxima Centauri? Should the church send out missionaries to alien planets? Do extraterrestrials have their own version of Jesus? Did God have to move the Star of Bethlehem by hand? Earlier this year, the Pope said that Martians (none have been found so far, don’t panic) would be welcome into the Church. Consolmagno, who holds two planetary science degrees, has firm beliefs on the matter (clue: it’s a yes!). Aliens can rest easy about the prospect of space crusades, however. The long-serving astronomer says that finding ET does not disprove the existence of God. He hopes that, instead, the discovery of tentacled horrors from the void will lead people to question what being human means. ‘When we say human, human as compared to what?’ he asks. Consolmagno also addresses such pressing questions as whether God had to move the Star of Bethlehem by hand. Yes, you read correctly, according to this set of leaked emails, the Vatican – one of the most important religious authorities in the world – knows aliens exist.